Hallway Ideas. You probably don’t think much about yours. Often, they’re simply a windowless walkway. A straight line, to get from point A to point B. It’s not a place you generally linger, like your kitchen island or family room sofa. There’s no place to sit down. Nothing to look at. 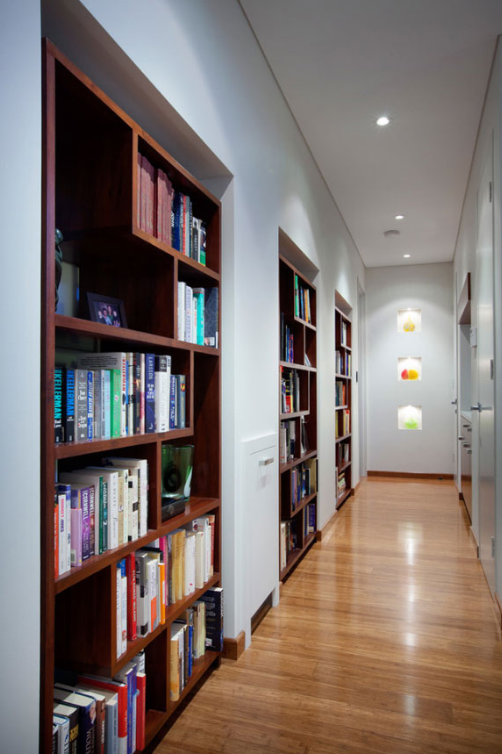 What if instead of a closed-off corridor, it was a gallery, a library or even an architectural highlight of your home? 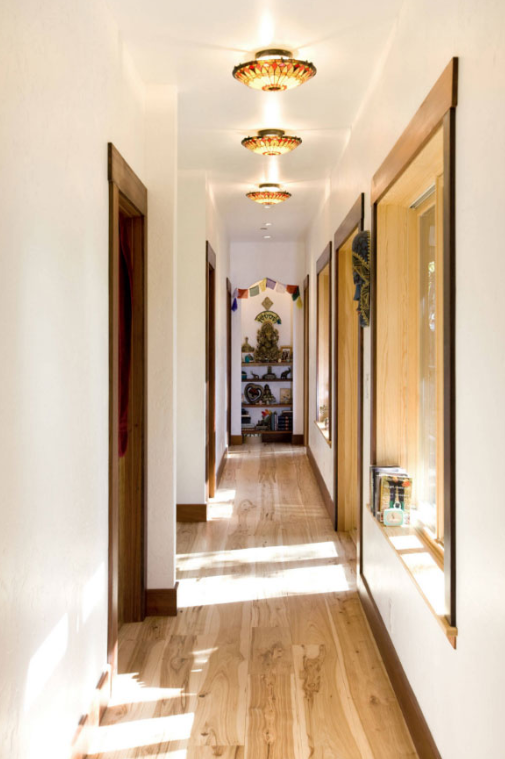 Hallways can do more than connect rooms, they can reflect you, the homeowner. How they reflect you depends on the size of your hallways and your style, of course. 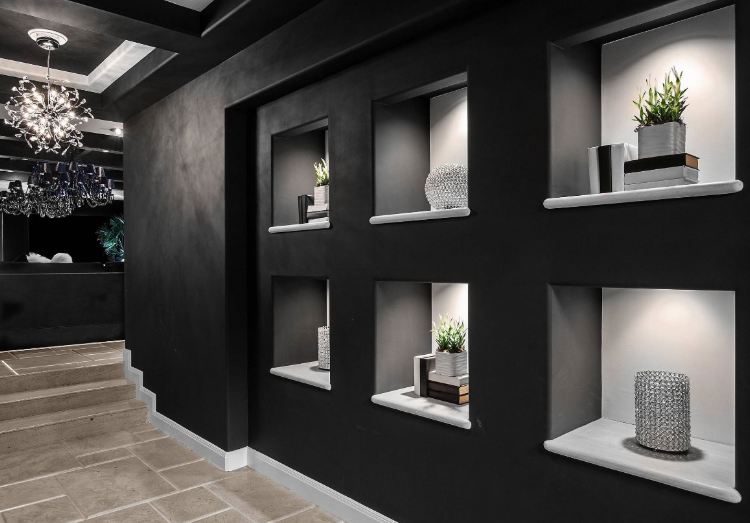 You’re not going to squeeze a console table into a three-foot wide hallway, and you’re probably going to need more than a few 8×10 pictures if you have a long hallway that’s five feet wide. As with any design, you have to consider scale and function along with style. Here are just a few hallway decorating ideas. The most obvious way to upgrade your hallway is to do a gallery wall–a curated collection of your favorite art pieces and/or photographs. You can display them in a modern grid style with matching frames, or a mishmash of frames and sizes for a more eclectic, thrown-together look. Consider highlighting your gallery wall with directional lighting to showcase your favorite artwork or cherished memory. 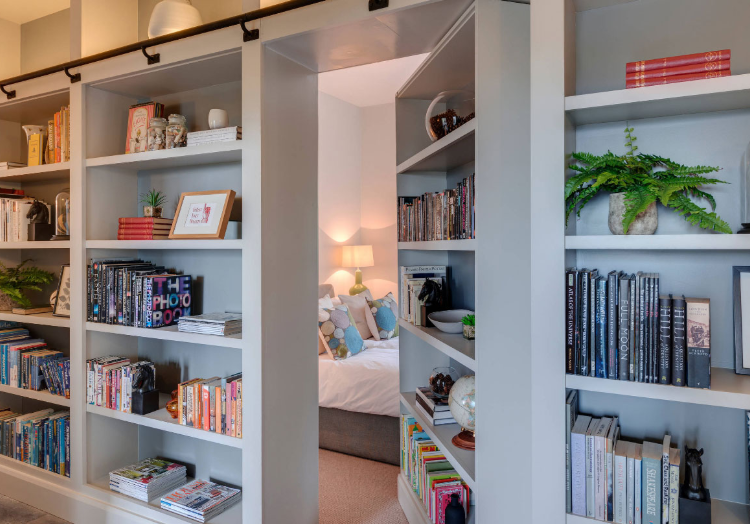 If you have more width, you can showcase sculpture, pottery or other art in built-in-alcoves or bookshelves. Spotlights on these pieces make a dramatic statement. No sculpture to show-off? No problem. 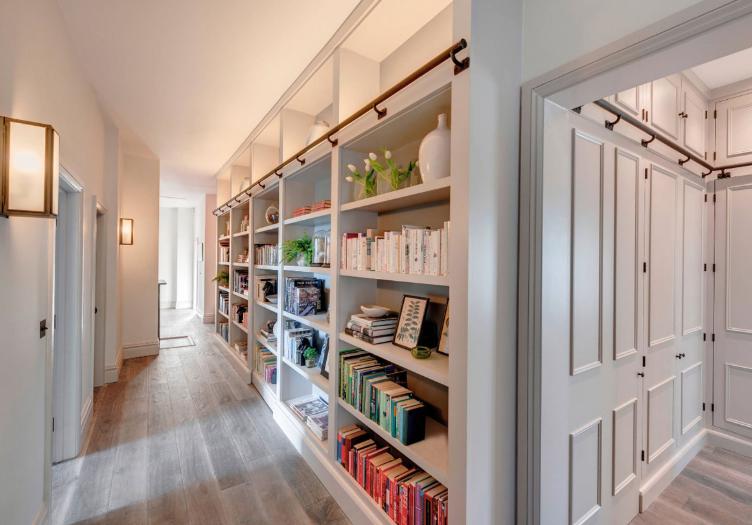 Turn your hallway into a library. This adds color, dimension, and function to an otherwise unused space. Prefer a cleaner look, but still want to add style? Custom millwork, creates an architectural feature out of a blank slate. Bare walls become artwork themselves. Creatively worked ceilings draw the eye up. Don’t forget about what’s under your feet. The floor can be a great place to add pops of color and pattern. 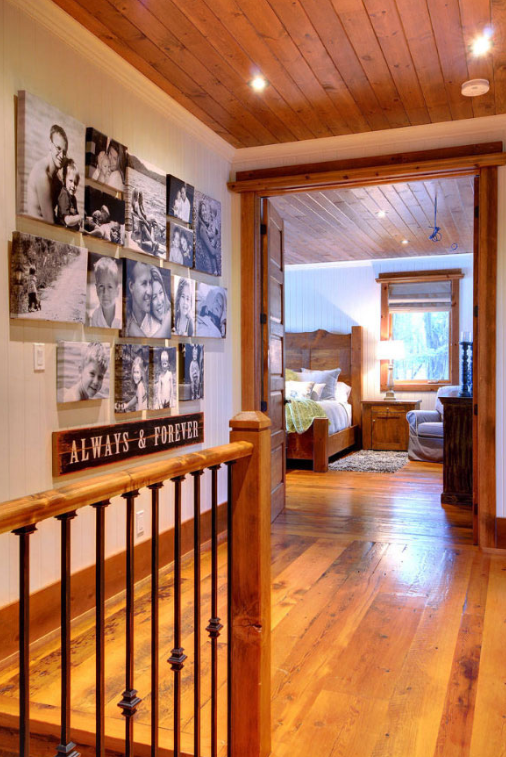 Wood planks can be shaped into a pattern different from traditional patterns in rooms. Intricately designed runners add warmth and style to the space. You may be tempted to overlook lighting in the hallway. Most hallways have one, maybe two, standard ceiling lights. Maybe they’re flush mount, or recessed, but chances are they’re not very interesting. Small chandeliers can add drama to the ceiling. Spotlighting artwork adds interest and directs the eye across the walls. Sconces can also sculptural interest to otherwise bare walls. 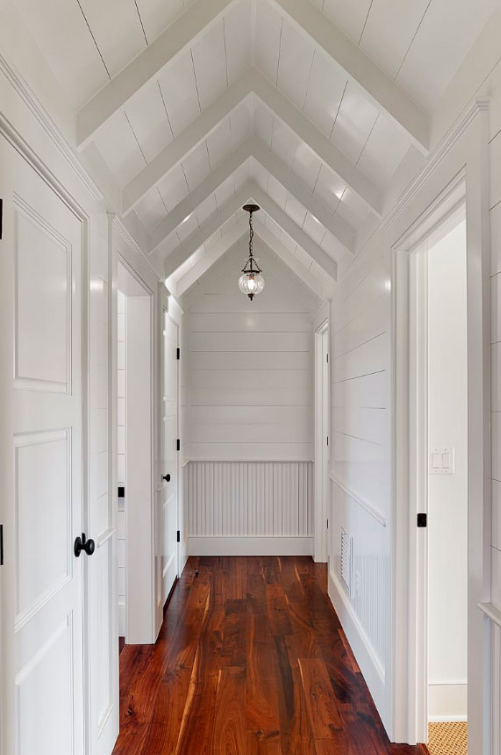 Check out these highlights of hallway ideas. They are sure to inspire. A terrific idea in this hallway for displaying those precious family portraits and pictures from favorite vacations spots and events. The grid of black and white frames is offset by colorful photos and complemented by the grid on the globe-like lights. 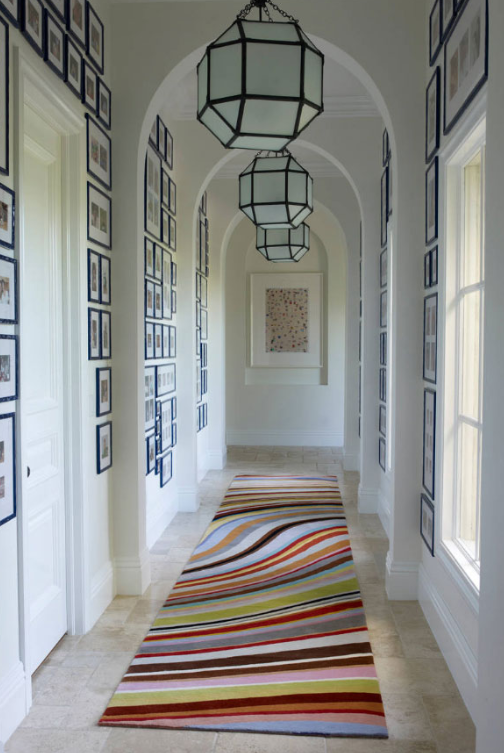 The wave-patterned rug adds whimsy and a pop of color to an otherwise white-washed walkway. With the beautifully displayed sculptures at the end of the hall, you will want to get from point A to point B a little faster. And though the sculptures are clearly the focus of this hallway, the colorful flush mounts will entertain your eyes until you can examine the souvenirs displayed at point B. The hallway in this downtown contemporary penthouse boasts a gallery that leads to the master bedroom. Really cool contemporary bookcases that you’ll notice aren’t standard design. Also love the lighted nooks at the end of the hallway to feature your favorite tsatskes. Monumental wall of niches! Looks like each 24″x24″ niche holds a special treasure. Magnificent hall with stunning bookcases, but wait there’s more — see next picture. There’s a hidden door and behind it a bedroom! How cool is that? 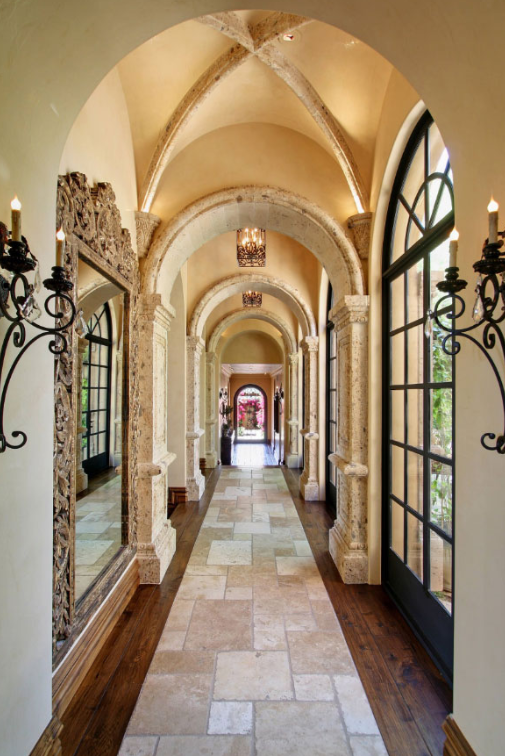 An exquisite hallway to feature this homeowner’s special accent pieces. Rich, dark and dramatic. 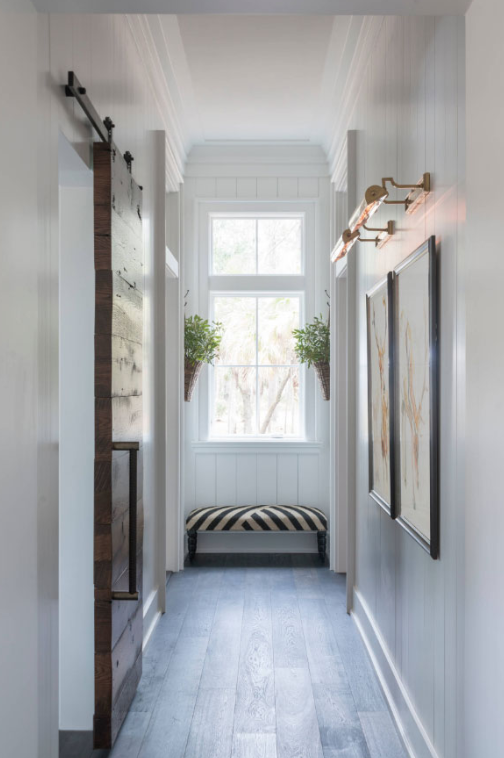 So many great features in this charming farmhouse hallway: barndoor, lighted art pieces and a cute bench at the end of the hall. 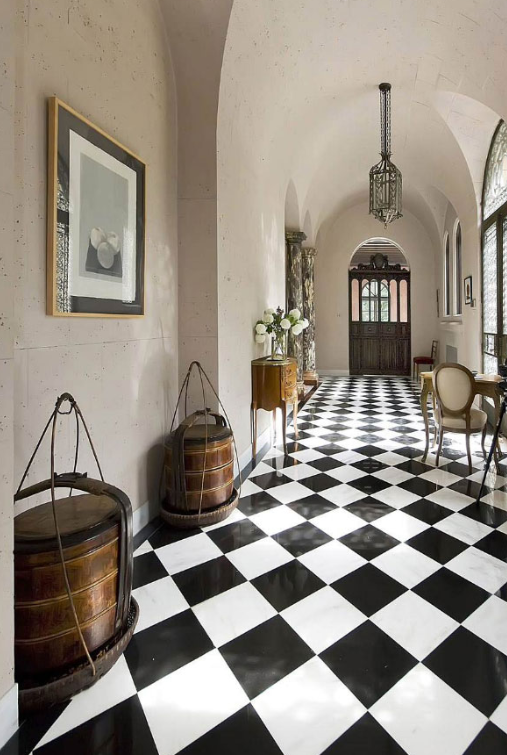 The floors steal the show in this beautiful traditional San Francisco mansion. 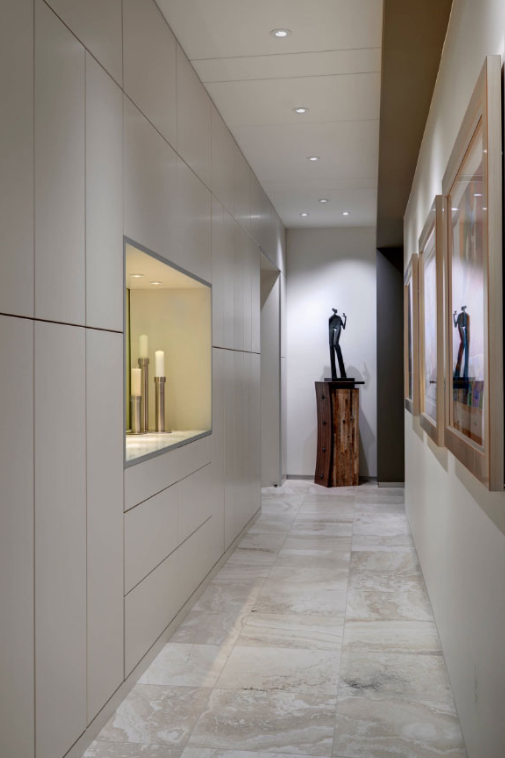 From the richly stained wood plank floors to the unusually peaked ceiling, this hallway is architectural artwork. The warm floors prevent the white walls from becoming too stark while the headboard and shiplap add textural interest to a mainly monochromatic color scheme. The beam-lined, peaked ceiling is the highlight of the design with a single pendant light accenting this dramatic hallway. Another take on the family gallery. This time with unframed family prints and a touching plaque. You can feel the love and warmth in this hallway.